Three people have been injured in a serious incident at a nuclear power plant in Lancashire. Power company EDF, which owns Heysham 1 power station, said the employees were taken to hospital following an "accidental steam release". The BBC understands one person suffered burns, one a broken hip and the other a broken back. 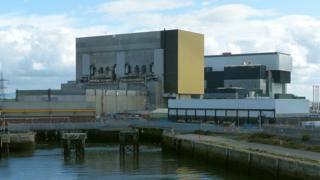 EDF said Monday night's incident was not related to the nuclear process and there was no danger to public safety. The casualties were said to be conscious and speaking when they were taken to hospital. Five fire crews attended the incident at 22:40 GMT and remained at the site for more than two hours as a precaution. A spokeswoman for EDF said a "full investigation" would now be carried out to determine the cause. "It goes without saying that everyone's thoughts are with our three colleagues who have been injured," she said. "We will be doing everything we can to support them and their families while they recover. "There was no risk to the public during the incident which is now under control. Safety is our overriding priority and we will investigate how this happened."